Sometimes a thin sheath of nylon isn’t enough. If you want serious backup protection for your skimo gloves, check out the Crazy Idea Over Gloves. They pack up small but contain a healthy amount of insulation to stave off frostbite. Just slip them on and the elastic wrists will hold ‘em in place. Use the palm window as necessary to operate any finicky equipment. The Over Gloves are great for long races, night training, or adventures into the unknown. Elastic wrist band makes it easy to slip on and off. Hole in the palm offers a quick dexterity option. Notes Finger hole in palm. Bottom Line Ultralight and packable insulation. I got these because my CAMP G-Comp Warms get wet sometimes and don't dry out... figured I'd try a different inner glove w/a removable outer. Using the Arcteryx Venta (which is awesome) w/these in the pack. Generally my hands are cold a lot. These are very small, they pack super light, and are surprisingly warm. They aren't so warm that they'll warm my hands back up if I've let them get very cold, but that's a temperature-management issue and no fault of the mitts. If I put em on before I get too cold, I won't get cold. The combo of these + softshell glove is ALMOST as warm as my personal gold standard BD's mercury mitts, but far more versatile/dextrous and a lot lighter / less bulky. For $50 they're a no-brainer and they've already kept my hands adequately warm in about the coldest normal conditions I tour in. Idk about the wind-resistance as I'm wearing a windstopper glove under them, but I've been in very windy conditions with them without having a problem. Others have mentioned wearing them around the wrist, but they're a little tight on my wrists. No matter though since they take up so little space that any pocket is enough for them. A surprisingly functional piece of kit, and especially in the realm of relatively specialized and expensive touring gear, you get a lot of bang for your buck. OVERALL: Outstanding! after using these for most of a season of training, racing and touring, I can confidently say these have been a GAME CHANGER for the way I layer for my hands. 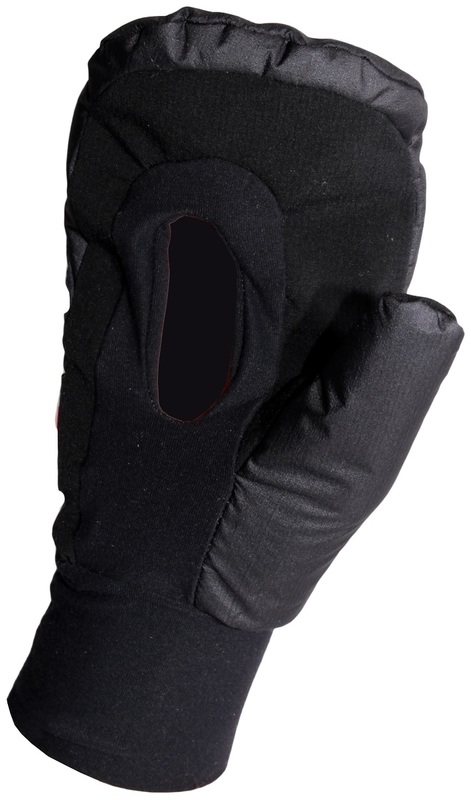 HIGHLY RECOMMENDED for those that enjoy the breathability and dexterity of a thin liner style glove most of the time but occasionally need a quick boost in warm/wind protection (without having to dig through your pack for a bulky warm glove). IN USE: I utilize a thin liner style glove 95+% of the time on the uphill and used to hate having to transition into thicker/warmer gloves for each descent (excluding racing). Its now super easy to wear these around my wrists all day and quickly employ over the fingers of a thin liner glove for a significant boost in warmth and wind protection as needed. It can be a little challenging to put on or remove a jacket layer with these around your wrist but not over your fingers but I have found if you bunch up the mitten portion in a closed fist, it can pass through a jacket sleeve much easier. PROTECTION: I wouldn't call them windPROOF but they make a HUGE impact on warmth in cold and windy conditions (I'm assuming they are quite a bit warmer than the CAMP windmit'N but I haven't used those so can't say for sure). Haven't encountered sustained rain in them (they aren't waterproof) but the DWR treatment has shed snow precipitation off them just fine. RACING: I've used them in a number of races as well and have found it easy to transition with only one hand (all 5 fingers including thumb) out of the mitten. Its a second or two slower to re-cover the fingers than exposing them but it get a little quicker with practice. DURABILITY: I've put two small cuts in them over a season of use (presumably from a ski edge while transitioning with them over the fingers) but otherwise no issues. Hi Richard, the medium should work well for you. pros/cons of this over glove vs. the more expensive ski trab option? also any insight on sizing? i couldn't find a sizing chart on crazy idea's site. 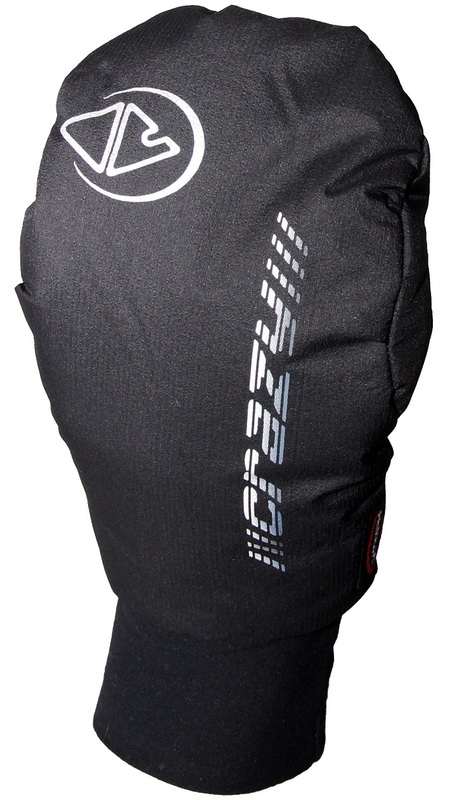 Hi Andrew, the Crazy glove is a little lighter and more packable. The Trab is more windproof. They are a tossup in warmth. The gloves have Euro sizing which is about 1 size smaller than US. If you're normally a medium in the US, go large.